Home / Bridal Style / Mother of the Bride Dresses: 20 Proper Picks for a Chinese Wedding! Being dressed beautifully for your daughter’s wedding is a must for every mother of the bride. But for nuptials within certain cultures, there are attire do’s and don’ts to be mindful of as well. 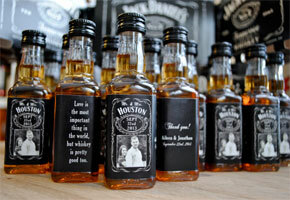 Think of it as being properly as well as prettily outfitted for the occasion! When choosing an MOB dress for a Chinese wedding, for instance, red is reserved for the bride, while black is believed to bring bad luck. Ideal color choices, then, would be elegant neutrals and sophisticated shades like mauve, lilac, or champagne, and metallics like copper, rose gold, or gold. 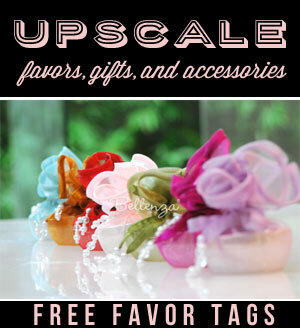 Safe, too, would be soft tones like light blue, pink, or peach. The standout features of this lovely dusty blue and silver gown are its beaded and sequined bodice with scalloped edges, and a double cowl neckline in front and in back. Nice touches for Mom, too, are the three-quarters sleeves and the ankle length skirt for easy movement. A sweet number in blush and silver, this simple sheath gown comes with a ladylike capelet, gracefully draped from a V-neck and V-back to an asymmetrical hem edged in a bead and sequin trim. This matching tea-length dress and jacket set comes in an unusual pewter shade with a soft textured shimmer on the jacket fabric. Thoughtful features for the full-figured mom are the below-the-hip jacket length, the mandarin collar, three-quarter sleeves, and shoulder pads. Underneath, the square-neckline dress has a flattering tea-length silhouette. This simple inner shift dress in a dreamy shade of smokey orchid is complemented by an elegant embroidered overlay simulating a long jacket (it’s actually non-removable). Mom will love the just-at-the-knee dress hem and the dressy 3/4-length of the jacket sleeves. For this floor-length dress in a graceful column cut, coverage is provided by softly draped full sleeves and a ruffled front overlay. The chiffon fabric is in a sophisticated cabernet shade, with hand-sewn jewels at the neck adding a touch of glam. Available in full size range (A0-A30) and custom sizing, with padding and boning. 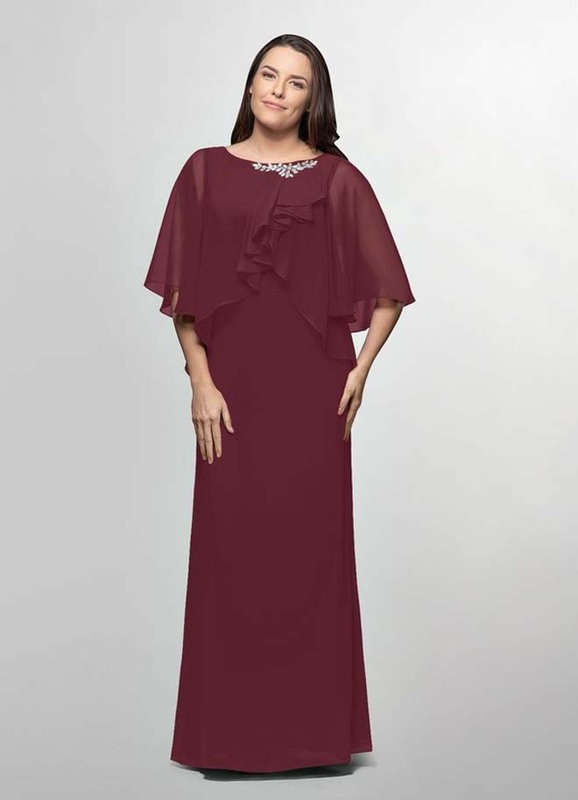 This floor-length chiffon dress comes in a striking rust shade, with a slight off-the-shoulder neckline, graceful gathers across the bodice, and a decorative lace applique on the waist. Available in full size range (A0-A30) and custom sizing, with padding and boning. Go for a youthful look in this jade colored, knee-length A-line dress in all chiffon. Pretty features are the sewn-on applique on the shoulder, and the cowl neckline that leads to a soft bodice overlay with a v-back. Available in full size range (A0-A30) and custom sizing, with padding and boning. 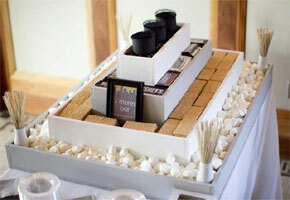 So soft, so simple, so sophisticated! That’s the air exuded by this chic 3-piece, all-chiffon set—an inner sheath top, ankle-length pants, and a flowy sheer knee-length jacket with 3/4 length sleeves. 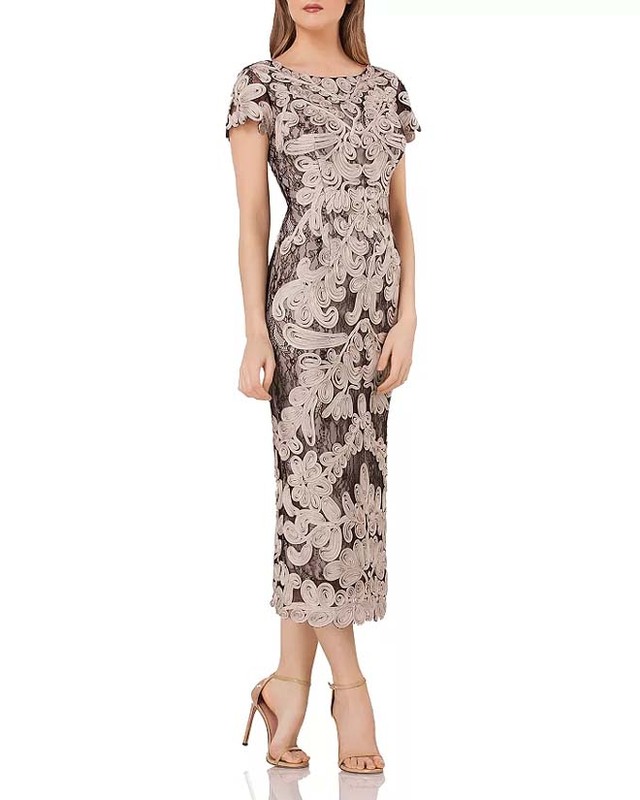 Hit the height of glam in this knee-length sheath dress with a delicate lace applique over a soft satin lining. Providing a stylish coverup is a long chiffon jacket with slim ¾ sleeves. A softly-shaped inner column dress in a luscious plum color gets added pizzazz from a matching overlay in a sheer patterned fabric. Great for a little coverage with lots of style! 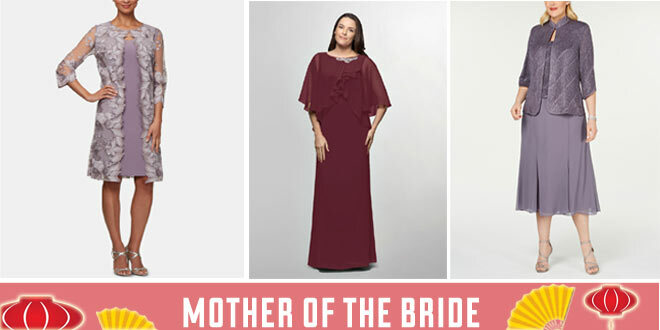 Mom just might steal a bit of the bride’s spotlight in this vintage-style gown! Stunning magenta-colored lace graces its V-necked bodice, full floor-length skirt, and long sheer sleeves gathered at the wrist. Definitely a head-turner, this midi-length sheath dress features gorgeous allover lace with color-blocked tapework in oyster and black. Mid-stretch fabric allows for its body-skimming fit, while added flattering features are its boatneck, V-back, contoured cap sleeves, and contoured hem. 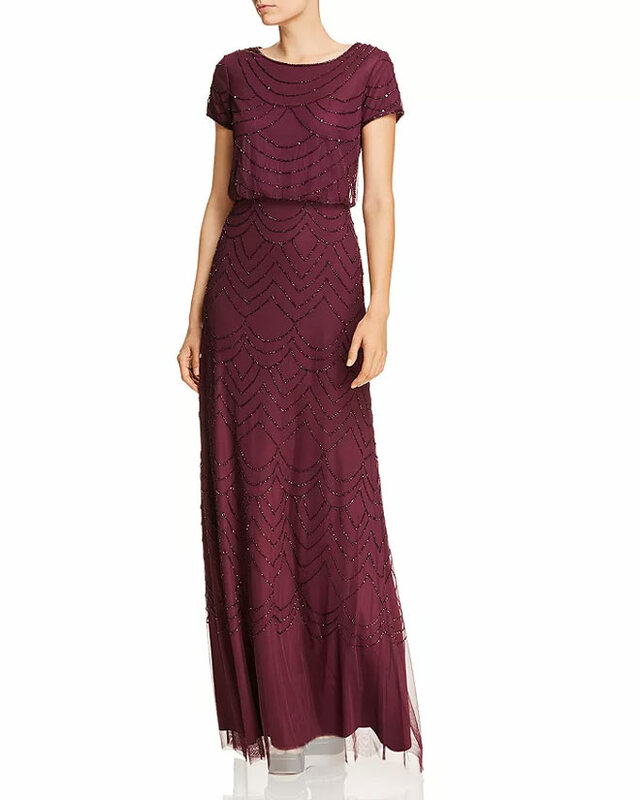 With a shimmering pattern a la Art Deco design, this gown comes in an elegant shade named after Cassis liqueur. It features a soft blouson bodice, a seamed waist, and an A-line skirt. Youthful touches are its round neck and short sleeves, while its allover bead-embellished mesh overlay adds definite glam. 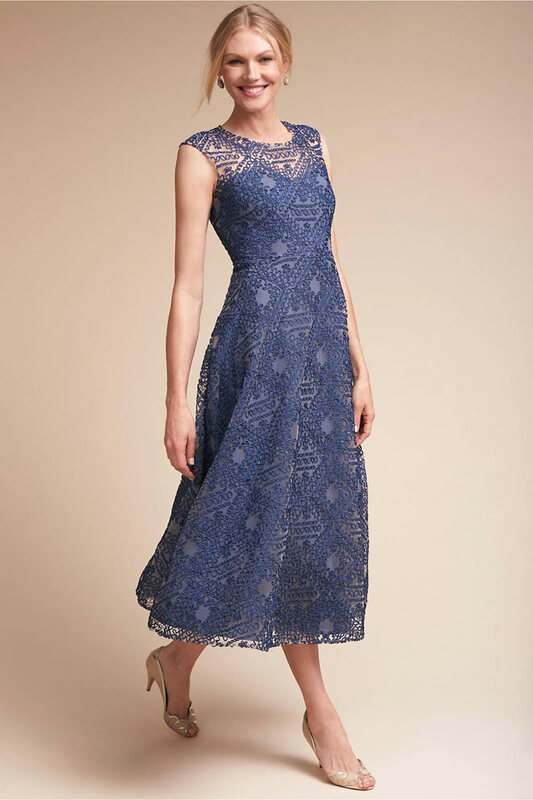 Form-fitting and feminine, this sheath silhouette dress in navy and gold will have Mom looking her best. 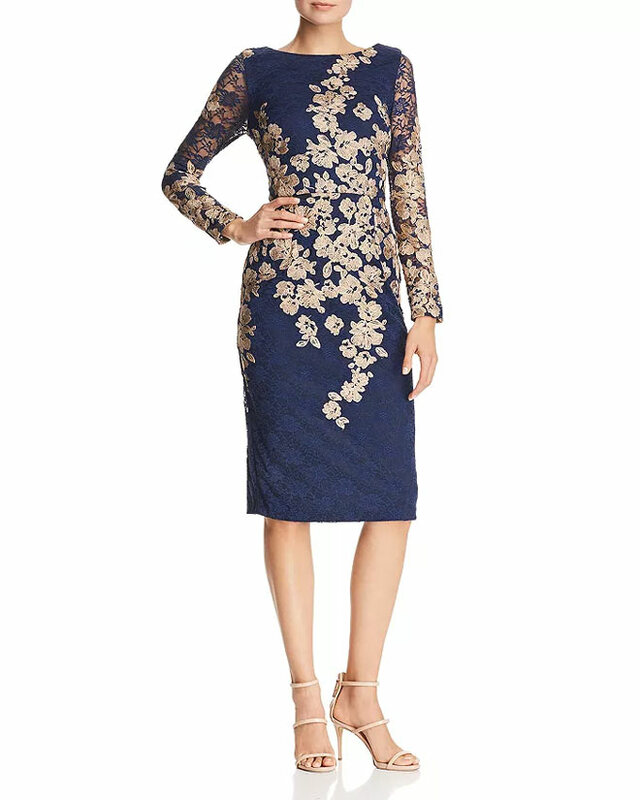 The allover floral lace and metallic floral embroidery are showstoppers, while the boat neckline, seamed waist, and semi-sheer long sleeves complete the look in style. Another sheath silhouette, this time in gorgeous single-colored floral lace with an off-shoulder, tiered bodice overlay. The contoured edging on the overlay and the skirt hem are sweet touches, too. Lots to love in this elegant piece—its silvery grey hue, deep V-neckline, full tea-length skirt, and three-quarter sleeves which all give it a decided mid-century air. Oh, and it has pockets, too! Fabric embellished with an allover geo appliqué makes this below-the-knee dress in pretty blue an instant charmer! Then, there’s that extra appeal of the illusion neckline and back allowing the geo pattern to frame the face. 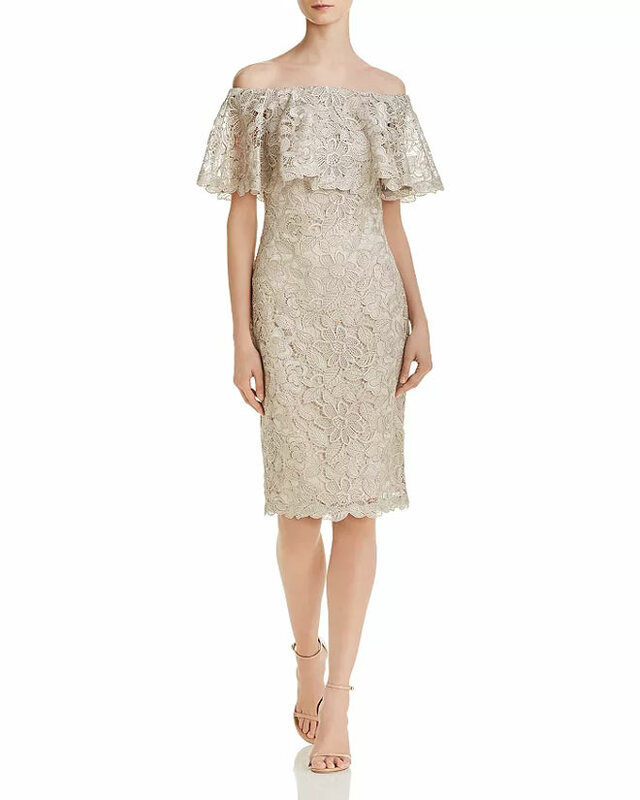 A feminine take on the color block effect makes this slim sheath dress particularly eye-catching, with ornate applique scrolls in a clay shade over a porcelain lace foundation. Mom will appreciate the high neck, the cap sleeves with contoured edging, and the back slit for walking with ease. 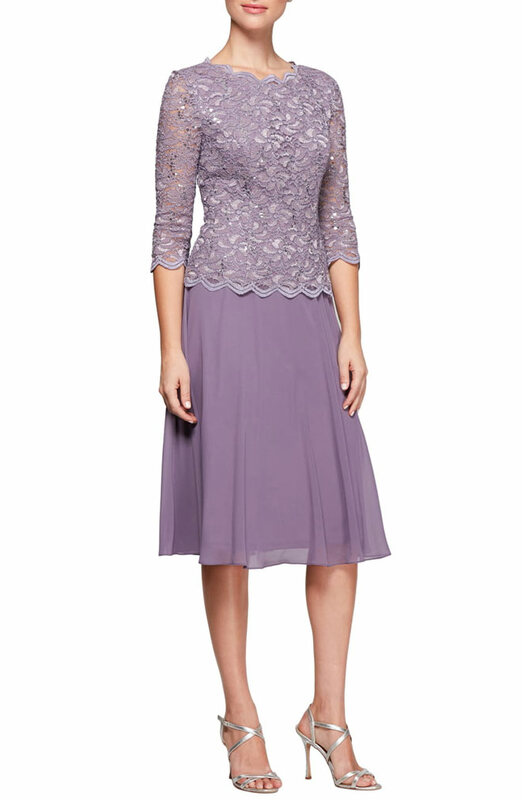 The lace bodice with three-quarter sleeves creates a two-piece effect over a softly flared skirt in georgette—all in an exotic shade of icy orchid. Celebrate such a special occasion with sparkle! 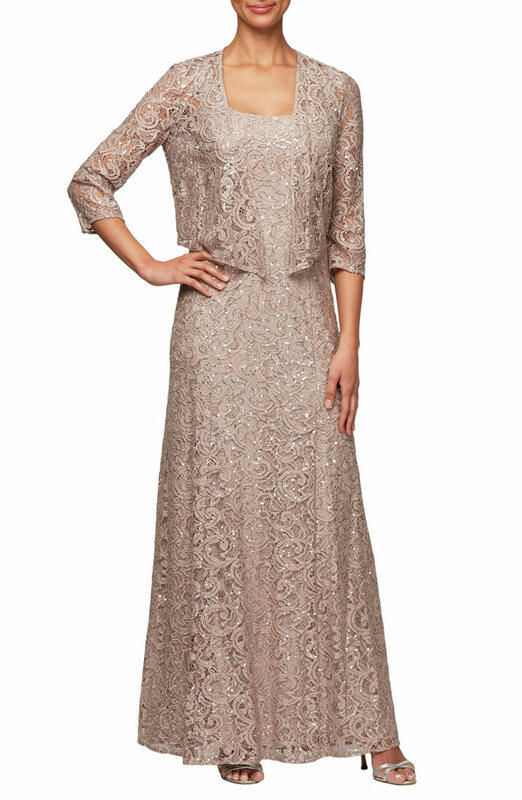 This softly slimming gown and coordinating jacket in buff-colored stretch lace are sprinkled with tiny sequins.